One thing that I particularly like about this definition of a pathography – which is more description than a definition, is that an illness blog is also typically an extended single-authored narrative, situating illness and treatment within the author’s own life. It then is not difficult to say that blogging is a modern-day form of pathography. Where this idea gets challenged is the difference between stories and narrative. Where the stories may be an authentic telling of experience, exactly what is done in an illness blog, narrative requires some form of post-processing where the writer does further reflection on the topic. Further, narratives have structure (Frank, 2010). A blog would not be an extended narrative, it is simple narrative. Each post is a condenses story of the patient’s experience with an aspect of the illness. This change in form actually may lead to better opportunities for learning from illness narrative, as the content is presented in smaller bite-sized chunks. Each post being a short narrative of a single aspect of the disease experience. By writing pathographies, patients not only restore the experiential dimension to illness and treatment but also place the ill person at the very center of that experience. (Hawkins, 1999, p.128). Hawkins (1999) highlights that the phenomena of pathography in book form is a relatively new practice. She states “with few exceptions … pathography seems to belong exclusively to the second half of the 20th century” (p.127-8). Wiltshire (2006) suggests that pathography emerged as a result of the successes of the post-world word two advances in medicine. Frank indicates that this is likely because of the turn in medicine away from narrative towards the clinical ‘evidenced-based’ view of illness and disease. He further suggests that illness narratives align with the post-colonial area where people demand to speak for themselves rather than being spoken for (Frank, 2013). The common denominator of all pathographies, whatever the ostensible motives of their authors, is that the act of writing in some way seems to facilitate recovery: the healing of the whole person. (Hawkins, 1999, p.129). I will end this post with a reflection of what I hope to learn from my research process – that is, what do I hope to learn from the research that I am about to conduct. I hope to finish with some validation for the work that I’ve done over the last 18-months, blogging my way through breast cancer treatment. I want to better understand who learns from reading blogs, and what they learn. This in-turn will help me teach others how best to write an illness blog. It will also help improve my personal blog, as I will then have a much better understanding of who is reading it and what they hope to learn from reading it. But most of all, I see it as a form of healing. I hope that this process will lead to some form of healing for the mental and emotional wounds caused by the traumatic cancer treatments. Frank, A. W. (2013). The wounded storyteller: Body, illness, and ethics. University of Chicago Press. Frank, A. W. (2010). Letting stories breathe: A socio-narratology. University of Chicago Press. Hawkins, A. H. (1999). 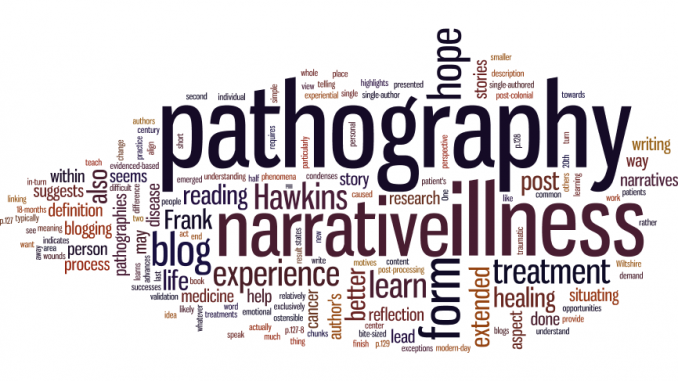 Pathography: Patient narratives of illness. Western Journal of Medicine, 171(2), 127. Wiltshire, J. (2006). Pathography? : medical progress and medical experience from the viewpoint of the patient.